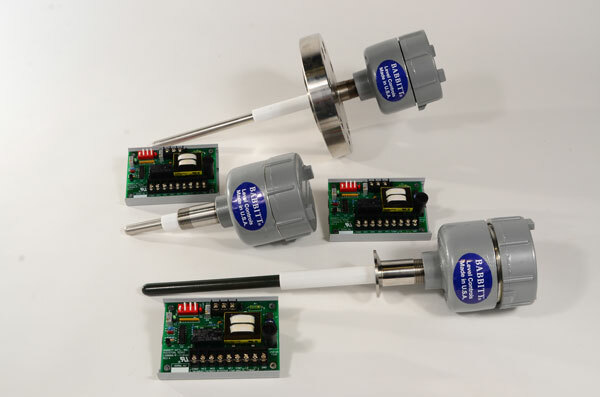 The LS8000 remote-mounted radio frequency (RF) level switch is the perfect choice when it is unsafe or inconvenient to mount the electronics directly to the probe. The ultra-high sensitivity adjustment on the LS8000 allows sensing of the driest powders, fines and flakes. The LS8000 is perfect for materials such as dry herbicides, plastic pellets and fly ash, as well as virtually any liquid. 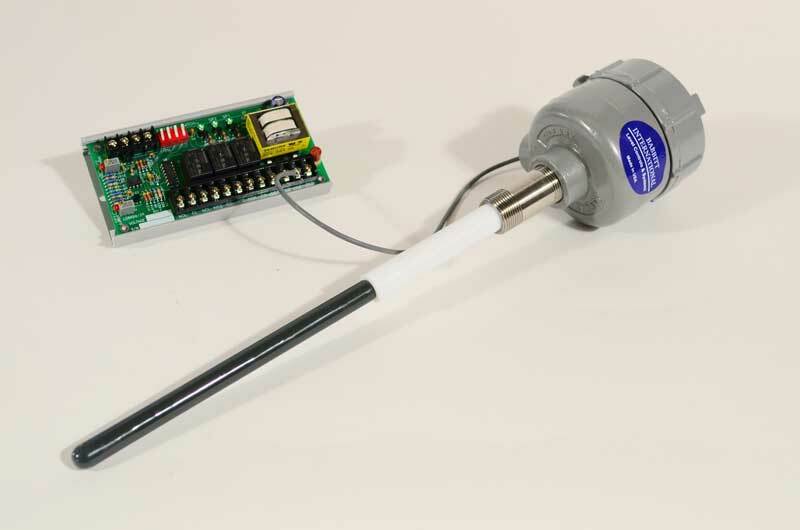 The probe consist of a maintenance-free epoxy-encapsulated transmitter mounted in an explosion-proof housing. The transmitter is connected to the receiver with a twisted, shielded pair of wires (Belden 8761 or equal). 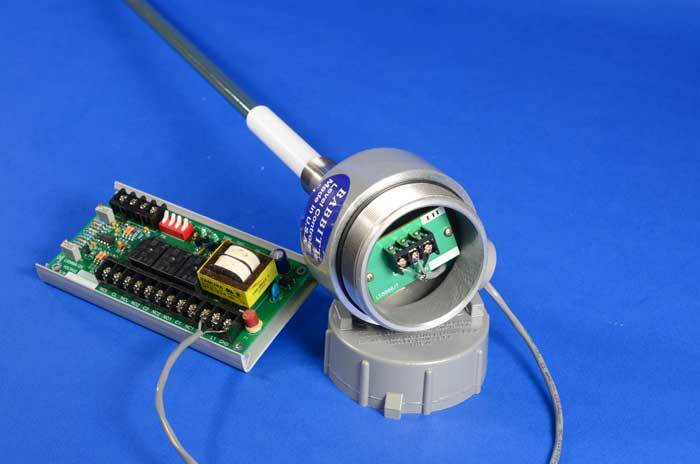 The receiver board is wired to the supply voltage and has all the necessary calibration adjustments; failsafe and time delay adjustments, and the relay output. It is possible to calibrate the LS8000 without climbing a tall tank or a probe can be located up to a mile from the nearest supply voltage. 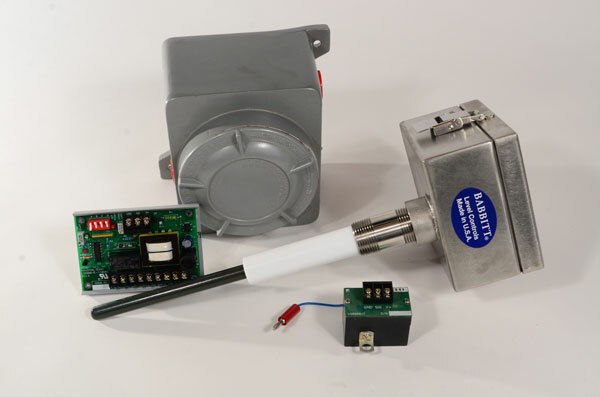 The remote mounting does not sacrifice the reliability, stability or performance that makes Babbitt International level switches famous. Every standard unit has an on-board fuse and surge suppressor to protect the circuitry from power surges. 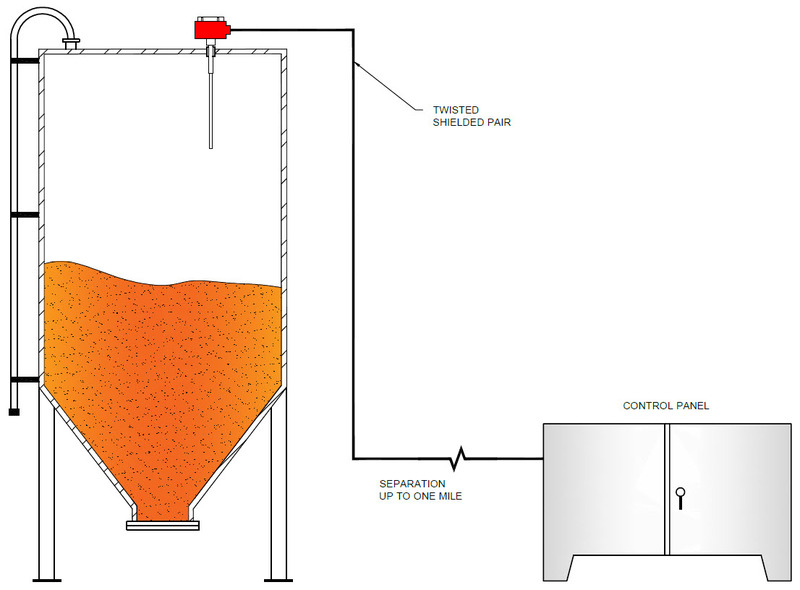 Additionally, a static suppression circuit protects against hostile bin environments created by static-prone materials such as plastic pellets. 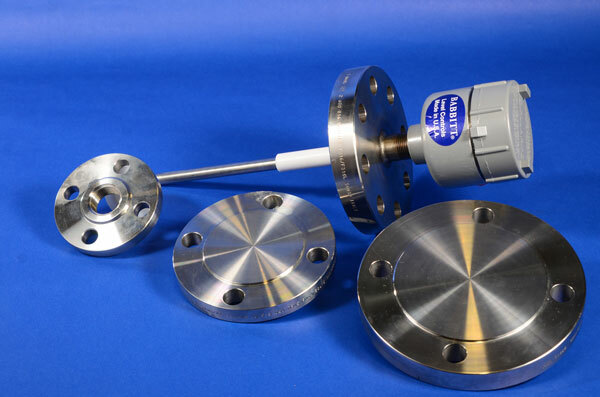 The standard probe is made of a solid 316 stainless steel rod, 3/4" NPT process connection and Teflon insulator. The standard seals are made with Viton "O" rings. All the electronics are housed in a cast aluminum explosion-proof enclosure. Other materials of construction are available. The solid stainless steel rod is available in a variety of lengths and is suited for liquids or bulk solids. 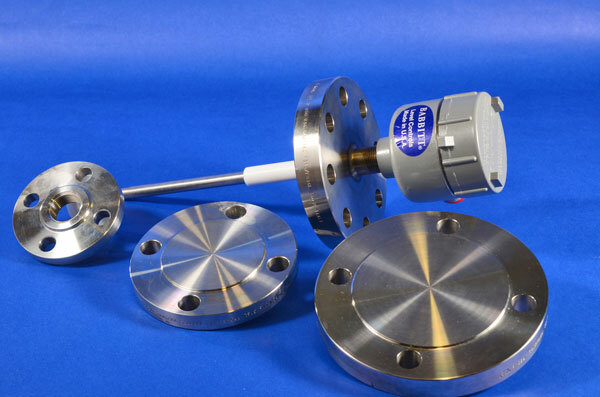 These probes can also be coated with Halar in lengths up to 72 inches. All the necessary calibration indicators are on-board so all you need to calibrate the LS8000 is a small screwdriver. Fail-safe electronics provide peace of mind. The modular electronics make trouble shooting and repair a snap. The entire unit is backed by our two year warranty and 60 day money back guarantee. Flanged process connections and special materials of construction are available. Please consult factory. * This describes an LS8000, powered by 115VAC, with 316 SS probe, 10" long. 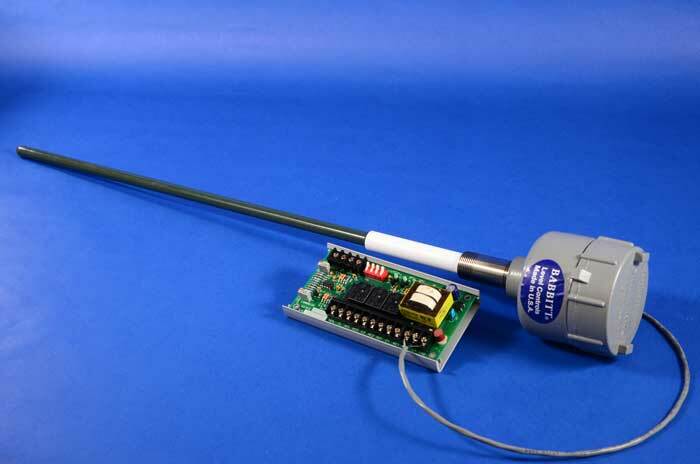 The probe length is measured from the end of the process connection to the tip of the probe.